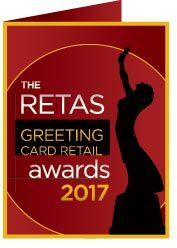 The Retas awards are the only dedicated awards for greeting card retailers. The Retas were launched by Progressive Greetings magazine in 2005, in recognition of the tremendous contribution that retailers of all shapes and sizes, make to the success of the greeting card industry. The Retas recognise and celebrate not only the top specialist greeting card retailers (both multiple and independent), but also department stores, garden centres, bookshops, supermarkets, gift shops as well as employees of outstanding excellence. The Retas are free to enter. Retailers are invited to self-nominate while publishers, suppliers, reps and agents are canvassed, asking them to nominate which retailers have excelled in the last year. The finalists of The Retas are announced every May and the winners are revealed at a lavish afternoon event at The Dorchester Hotel which takes place in July, taking on a different theme each year. Over 400 retailers and publishers attend The Retas for an afternoon of wonderful celebration and networking. To find out more, visit the awards website here. To book tickets or tables to The Retas 2017, please click here.